4/12/13: Discussion of “Bach Defended Against his Devotees” by T. A. Adorno. 2/22/13: Discussion of Chapters 3-4 of Philosophy of the Performing Arts, by David Davies. 2/6/13: Discussion of Chapters 1-2 of Philosophy of the Performing Arts, by David Davies. Discussion of “Living as Form,” by Nato Thompson and “Eventwork: The Fourfold Matrix of Contemporary Social Movements,” by Brian Holmes. Discussion of “Interaction and Nature Appreciation,” by Robert Stecker. The Aesthetics Work Group has a Facebook page that is more regularly updated. I will continue to update this blog periodically, but for the most recent activity of AWG, go to our FB Page and “Like” it. College of Charleston students are debating their professors and reviewing books and articles on some of the most popular and heated topics in their field. It is happening in reading or work groups, which are very common at universities, but most are open only to professors and/or graduate students. The Department of Philosophy hosts a very active interdisciplinary group, called the Aesthetics Work Group. They meet several times a month to discuss theoretical works about and in the arts. Topics in the past have ranged from participatory art to the “suburban sublime” and Tibetan poetry. Typically this group reads works in progress from participants – both students and professors. But, they have also had professors from other universities present works and plan to have professors from Utah Valley State, UC Davis School of Law, and Columbia University join via Skype to discuss their works. Readings are distributed a couple of weeks in advance by the person who will lead the discussion, usually the author of the readings. When the group meets, the author gives a quick background on the paper, then the group begins asking questions and discussion usually lasts for about an hour and a half. For more information about the Aesthetics Work Group, contact Jonathan Neufeld at neufeldja@cofc.edu. We had a boisterous discussion of ontology and art on Thursday, September 19. Matt Rabon’s (3rd year philosophy major) account of ontology was provocative and got a lot of us talking and jumping in. Professor Hettinger’s “Hat-rack David” example was particularly fruitful (Michelangelo’s David used as a hat-rack–for very large-headed people, pointed out Prof Nadelhoffer–instead of a work of art). Discussion touched on Michelangelo, Beethoven, Cage’s 4’33”, Jeff Mangum, and the different versions of Nirvana’s In Utero. A pen was (temporarily) transfigured into a work of art (documentation by Prof Koerner can be seen on AWG’s Facebook page), though authorship was contested as was the possibility of the temporariness of the transformation. Our first meeting will be led by Morgan Koerner of the German Department at C of C. He will be discussing the philosophical background of his position paper, “Affect in German Theater after the Performative Turn: Elfriede Jelinek’s Theater Texts in Performance.” We will read the position paper (it’s very short—4 pages), and the Introduction of Altieri’s The Particulars of Rapture: An Aesthetic of the Affects. Professor Koerner or I will send these readings along shortly. We will also take a look at a few video examples of productions of Jelinek’s work. The topic is connected to last year’s discussion of authenticity in performance and raises new topics on the role of the affects in artistic production, appreciation, and performance. After a rousing meeting on Davies’s first two chapters (who knew ontology was so invigorating? ), let’s do a bit on Authenticity in Music from Davies. I will summarize the bits of chapter 3 that are relevant for chapter 4, so you only need to read 4. But, of course, those interested should feel free to read 3. We will also give a quick snapshot of Ch’s 1 and 2 for those who couldn’t make it last time. After we finish Davies, we’ll do something a little less analytic and abstract. I’m open to suggestions, if people are interested in anything in particular–I was thinking it might be interesting to do a screening of something (of an opera, a film, whatever) at some point, if there was interest. Professor Koerner will be giving us something on affect later in the term. In 1997, J. M. Coetzee’s delivered the Tanner Lectures on Human Values that would become his novella The Lives of Animals. 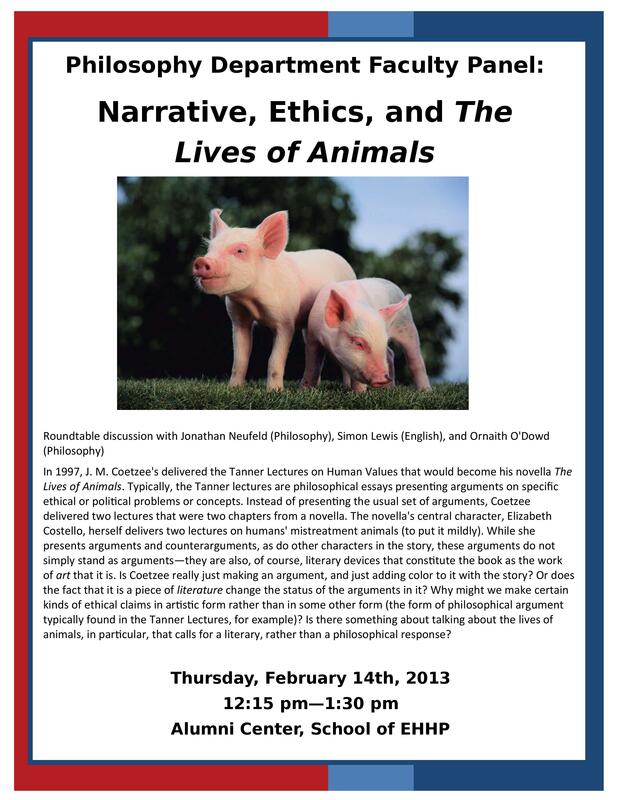 Typically, the Tanner lectures are philosophical essays presenting arguments on specific ethical or political problems or concepts. Instead of presenting the usual set of arguments, Coetzee delivered two lectures that were two chapters from a novella. The novella’s central character, Elizabeth Costello, herself delivers two lectures on humans’ mistreatment animals (to put it mildly). While she presents arguments and counterarguments, as do other characters in the story, these arguments do not simply stand as arguments—they are also, of course, literary devices that constitute the book as the work of art that it is. Is Coetzee really just making an argument, and just adding color to it with the story? Or does the fact that it is a piece of literature change the status of the arguments in it? Why might we make certain kinds of ethical claims in artistic form rather than in some other form (the form of philosophical argument typically found in the Tanner Lectures, for example)? Is there something about talking about the lives of animals, in particular, that calls for a literary, rather than a philosophical response? The Halsey Institute will be hosting a series of poetry readings during the January to March 2013 exhibition, Lesley Dill’s Poetic Visions: From Shimmer to Sister Gertrude Morgan. The Tongues Aflame poetry series is design to be a response to Dill’s fusion of language and image. All readings are free and open to the public. They will begin at 7:00pm and take place in the Halsey Institute galleries. A reception will follow each reading. Co-sponsored by the Halsey Institute of Contemporary Art, the College of Charleston’s Department of English, Poetry Society of South Carolina and Crazyhorse. 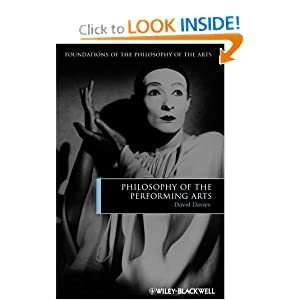 We will discuss Chapter 1 (“The Nature of Artistic Performance”) and Chapter 2 (“The Classical Paradigm I: The Nature of the Performable Work”) from David Davies’s Philosophy of the Performing Arts. If you need a copy of the reading, contact Jonathan Neufeld in the Philosophy Department.